Whether you're in the air or on the ground, trust Icom Radios and Transceivers to keep you in touch before, during and after your flight. Icom radios are great for listening to ATIS as you preflight your aircraft, and will come in very handy as a backup radio, or use as an Aircraft Scanner to monitor the airways. Tough, compact, and easy to use, Icom's IC-A14 VHF airband transceiver makes quick communication easy with a streamlined design, easy to operate controls, and the ability to name and organize up to 200 channels. The full keypad design allows users to enter channel or frequency directly with an exclusive button for the 121.5 MHz emergency channel. Sound comes through crisp and clear with the BTL amplifier and auto noise limiter while the large capacity Lithium-ion battery pack keeps it up and running. Icom IC-A24 VHF NAV/COM Pilots Hand Held Radio with Navigation. The IC-A24 is an easy-to-use handheld with a user-friendly, backlit keypad and a large, backlit display that shows both letters and numbers making for easy frequency recognition. The display and keypad's backlighting remain lit until manually turned off. The "flip-flop" channel recall function stores the last 10 channels used; these can be recalled using the "flip-flop" recall buttons on the front panel for faster switching between multiple channels. 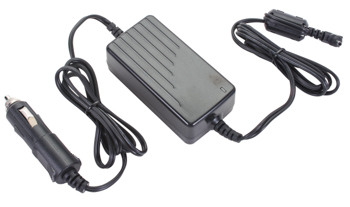 An external DC power jack allows for battery charging when using the BC-167 wall charger or the CP-20 cigarette lighter cable. When a battery pack is installed, simultaneous charging during operation is possible. Supplied Accessories: Battery pack, BP-210N or battery case BP-208N; belt clip, MB-103; carrying case, LC-159; Wall charger, BC-110AR/DR; Headset adapter, OPC-499; Antenna, FA-B02AR; Handstrap. For operation and charging with a 12V/24V cigarette lighter socket. For use with Icom IC-A6,Icom IC-A24 and Icom IC-A25 radios.